The idea behind the blog is to chronicle the execution of our plan. We have a strategy. However, as with most endeavors, there is the unexpected. Here you will see what really happens. With a number of projects open at any one time, the order of events vary. We spend a lot of time waiting for parts to be delivered, waiting for paint to dry, and lining up contractors. This is the practical reality of working with almost any project, but especially a restoration effort of this magnitude. The end result is we bounce between tasks. Tank 1 is essentially a Day Tank. Tanks 3, 4, and 6 were “settle” tanks where fuel oil was allowed to sit while debris settled to the bottom. Tank 2 was as an emergency reserve tank. Tank 5 no longer exists (at least we can’t find it). It is worth noting that Fir was built to supply lighthouses with fuel oil so her carrying capacity and facilities included accommodations for fuel as cargo as well as for her own use. Originally, the engines supplied depended on there being some static pressure in the fuel system. Previous owners did not want to fill the Day Tank and made several modifications to the fuel system. An electric pump was added to service the main engines and converted a lube oil tank to supply the generators with fuel. Our intention is to restore the system to its original state. Previous owners used Tank 2 as a waste oil tank. Since the cost of disposing of waste oil is so high in California, we decided to wait for now. Eventually, we will get to a shipyard able to handle the waste material at a more reasonable rate. There is a rumor that the existing fuel in Tank 1 was commandeered from a WW 2 minesweeper when both boats were docked at Pier 38 in San Francisco. 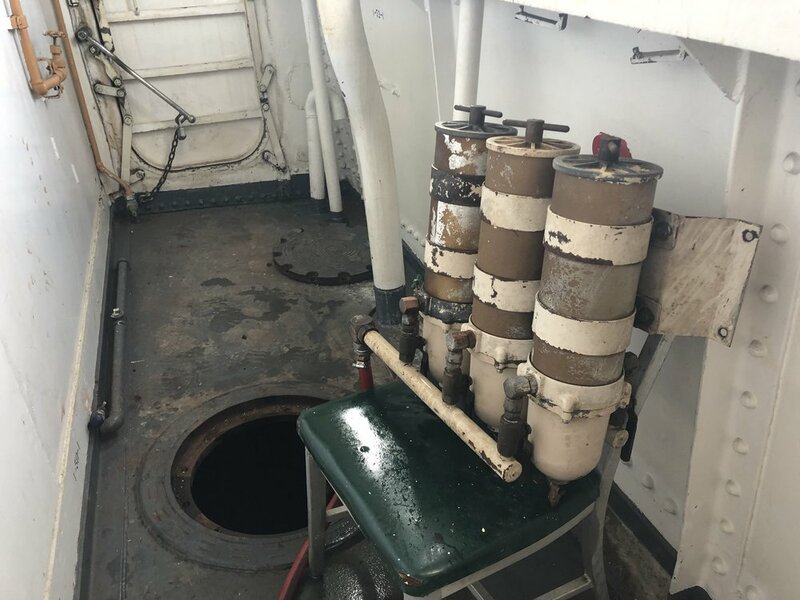 The story continues that when Fir moved from Pier 38 to its current location there was a crew member stationed in the engine room changing Racor filters every few minutes because the fuel was so polluted. Without knowing the truth one thing is certain, the fuel currently on board is crap. Tank 3 is the only one to appear untouched since Fir's decommissioning. This tank had slight scale and surface rust but was easily cleaned within a few hours. Our plan is to use Tank 3 to collect useable fuel from the other tanks. We will add new clean fuel and send the filtered product to our Day Tank. We estimate the Day Tank will need to be at least 20% full in order to create the necessary static pressure. This is about 2,500 gallons of fuel. A view of Fuel Oil Tank 3 from the hatch. We began by skimming off the cleaner fuel oil from tanks 4, 6 and 1 using a portable fuel pump. We ran the fuel through a Racor system setup with 30-micron filters then into Tank 3. We then started the grueling task of cleaning the sludge and miscellaneous debris that accumulated in Tanks 1 and 6. This was especially laborious since we do not have a disposable pump capable of removing viscous material from the bottom of fuel tanks. Edward and Pooch had to scoop the gloppy crud into 5-gallon buckets and pass them through the hatch. We then poured the goop into 55-gallon drums that we moved onto the buoy deck. Cleaning out 150 gallons of gelatinous material from the bottom of the fuel tanks. We planned to augment Tank 3 with 2,000 gallons of clean fuel oil from Ramos Oil of Stockton. We will then transfer the fuel from Tank 3 to Tank 4 passing it through a 5 micron Racor filter. Our temporary filter setup to move fuel oil from one tank to the next. Progress was slowed when the new owner of Helen and Herman’s Marina decided to remove all docks around Fir. Ramos has no way to deliver fuel by boat. Although the fuel can be delivered by truck, in accordance with California law, the transfer line can never be in the water. Therefore, a dock is necessary and the delivery will be rescheduled once we figure this out. Fir was fitted with two spotlights steerable from the Wheelhouse. The original bases were wood. Over the years, the wood was covered with different materials including a butyl rubber material and a lot of various kinds of caulk. When we acquired the boat, both lights rattled in their housing and leaked. So, we decided to start from the deck up and replace the base mount. The starboard spotlight as it existed at the time of purchase. Note the vertical control bar detached and sitting on the deck. The same spotlight after chipping away rotted material at the base. The new base built with 70-year-old teak from the Aurora. When Fir last sailed, the helm could only see the compass and two pressure gauges. Both gauges read air pressure in the operating system for the engine telegraph. More familiar devices with alarms and the ability to measure specifics such as RPM, temperature, and oil pressure were not included in the Wheelhouse. Instead, FIR operated with a team of engineers to monitor, read, and report all activity in the Engine Room. The Engine Room would communicate to the Wheelhouse by ship telephone and a few manual signal lights. Part of modernizing FIR is reducing crew count by updating equipment so that Engine Room data is always available to the Wheelhouse. Based on the reviews from Panbo, we decided to build our system around the EMU-1 from Actisense (about $430). There are several options for analog to NMEA 2000 converters. The EMU-1 seems to have more adaptable programming which is likely to be a big advantage for our application. The EMU-1 will convert data from 6 analog sending units, 4 alarm switches, and an inductive tachometer into a digital signal. The digital signal is converted to NMEA 2000 CANBUS sentences which are carried by the network. As a result, the information is available at several display units throughout the boat as well as smartphones. The EMU-1 can work with most sending units. The configuration software has profiles for sending units from most major manufacturers which will simplify the install. We selected VDO senders (between $20 and $40 each). Typically, the electrical ground for a sending unit is the engine block — so there is only one wire from the sender to the EMU-1, sharing the same ground. We are using “floating ground” or “isolated ground” senders requiring a separate ground wire since we are trying to lay new over existing systems. In a floating ground system, the sending unit requires two wires. The DC negative from the power supply passes through the sending unit then to the signal post of the EMU-1. The new system will include, a 12VDC power supply (about $20) powered from the 110VAC circuit, the EMU-1, and the sending units. One goal of the next work period is to build a test system where we connect the power, sending units and NMEA 2000 backbone to the EMU-1. This will test our network connectivity between the Wheelhouse and the Engine Room. It will also allow us to configure the EMU-1 to read the sending units that we selected. We expect to be able to set up all the standard gauges and alarms. Fir, however, has some rather atypical gauge requirements such as “reduction gear lube oil temperature". It will be interesting to see how well the EMU-1 and NMEA 2000 protocols will adapt to Fir. We have been rewiring Fir for months. First, we wanted to paint the masts therefor this process started from the top and worked down. After the application of primer (PPG Amerlock 2), we applied a single pass of top coat (PPG PSX 700 Light Tint Base) then started installing the various antennas, sensors, and lights. 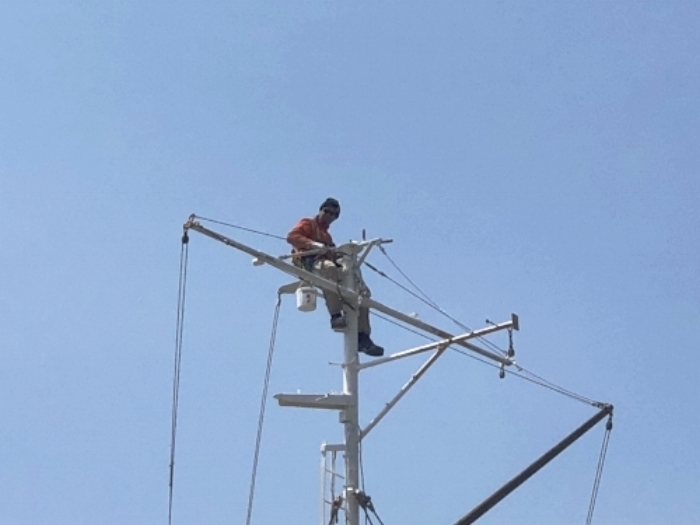 On the A-Frame (forward mast), we replaced the masthead and anchor lights with LED units from McDermott Light and Signal. We made room to accommodate two radar systems: a standard magnetron based open array unit and a digital doppler open array. We installed two Shakespeare 6396-AIS-R Phase III antennas for AIS. The mechanical weather station was replaced with a Maretron (WS100 ultrasonic). We added a Lars Thrane LT-1000 antenna for GNSS/GPS, heading and various motion sensors. Garmin GXM53 satellite antenna was added to capture XM Sirius marine weather reports, and we replaced the actuator on the original air horn. All of this equipment has been sitting unused for months as we finished painting the A-Frame and pulling wires. Joe installs one of the Shakespeare 6396 antennas. During our February work period, we started commissioning these devices. Frankly, it went better than expected. All but one device booted up as soon as we applied network power. A couple of wires for the Maretron weather station were damaged during painting, but easily repaired and the station was reporting. We mounted the antenna for our Furuno Class A AIS (FA170) to the A-Frame supports. This antenna connects directly to the AIS receiver. The AIS receiver connects to our Rose Point NEMO by way of an NMEA183 network connection. The NEMO then connects to NMEA 2000 network and our navigation computer running Coastal Explorer. This allows us to use the Furuno antenna as a backup GPS antenna that is available throughout the NMEA 2000 network. The Furuno GPS antenna for our class A AIS system mounted to support bar for solar panels between the two A-Frame supports. On boats larger than 50 meters, masthead and anchor lights are required on both the bow and stern masts. Fir also had numerous signal lights for a variety of purposes that will not be required in her new duties. The original lights were gorgeous bronze units with thick glass lenses. Unfortunately, they leaked terribly rotting the internal components. In addition, the original units were incandescent lamps that consumed a lot of electricity. We decided to replace these lamps with LED units from McDermott Light and Signal. The new lights are efficient, made from a polycarbonate material, and easily replaced. switching, The old lamps were repurposed into sconces for use interior use. One of the original anchor lights. On the aft mast, we are mounting the required masthead and anchor lights. We will also add a tow light consisting of two red signal lights, a white signal light, and an LED flood light to illuminate the 02 Deck. A panning camera will be installed to provide the Wheelhouse with an unobstructed view in all directions. Antennas will include a Shakespeare 3019 Seawatch HDTV,and Shakespeare A-VAT-10-R SuperHalo cellular booster kit. The Seawatch will allow us to receive over-the-air high definition television and FM signals. The cellular booster is important because, second to WIFI, cellular is our least expensive way to connect to the internet. We are down to final coats of paint, for now, and addressing a number of relatively small issues. These are difficult to show in photographs because the changes are so minimal in comparison to the entire project. A handy group of American Indians: Leo, Poochy, Harold, and Edward are helping us take care of these. Our greatest challenge this time of year comes from a commercial blueberry field only a few hundred feet away from Fir. Blueberries attract birds. Birds eat blueberries. Birds sit on Fir and crap blue excrement that has to be cleaned before applying the next coat of paint. So, every trip commences with a general boat cleaning that takes about a day. Then, every day begins with a wipe down to catch the bird deposits since the last cleaning. One of the last areas to complete is the aft mast. The aft mast is a difficult climb. The person working in this area must rely on the lanyard. In other words, they need to be willing to let go with their hands, lean back and trust that the climbing gear is safe. Only Joe and Leo are able to do this. Leo pressure washes the aft mast in preparation for painting. Finishing the aft mast is critical because we have antennas and USCG required navigation lights that must be installed. In July 2018, we set up our class A Automatic Identification System (AIS) transceiver. AIS has Class A and Class B systems. Generally, Class A is used by ships. Class B is used by recreational boats. Click here for more info on the system. Fir requires a Class A AIS transceiver. We have yet to make our global decision on a single marine electronics provider for the base system. The AIS transceiver is part of our secondary navigation system. That said, not all of the major manufacturers offer Class A systems. Ultimately, we chose the Furuno FA-170. 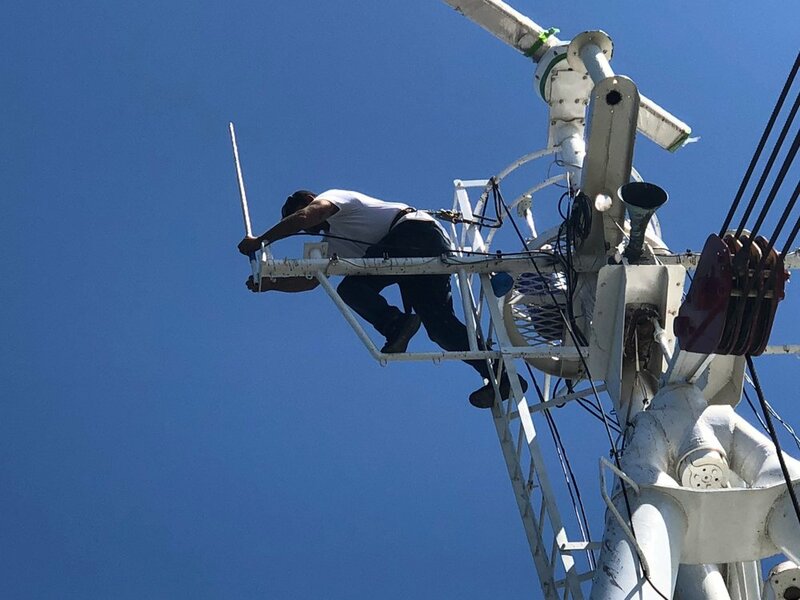 Joe installs our Shakespeare 6396-AIS-R to the top of the A-Frame mast. This is a 4 foot, top of the line (Phase III) antenna with 3db gain. The Furuno 170A has three components: 1) the user display, 2) the GPS antenna, and 3) the main box where all the action takes place. The "head" or display of the Furuno system is mounted to the bulkhead behind the chart table. Historically this is where Fir has mounted the communication systems. The Furuno 170A has an independent GPS antenna. We chose to mount the antenna between the A-Frame supports and just above the solar panels. In the (hopefully) unlikely event that we encounter a bridge or storm that strips off our primary GPS antenna, this antenna should survive as backup. Also worth noting is that we ran the wiring outside the mast bundle which adds to the independence of this system. The "main box" is mounted in the base of the chart table. Our starter system is not complicated. We are only trying to connect the three components and have them function locally (the Furuno 170A is capable of extremely complicated network systems).. The connection between the antenna and the main box is simple. The kit includes a wire with appropriate ends that plug into the base of the antenna along with the base of the main box. The wiring between the head and the main box seems overly complex. Furuno provides plenty of cable to connect the head and main box but, this is raw cable and you have to strip the ends before placing them into a connector. The head needs a special tool to connect the wires to the terminal. Therefore, the body of the unit must be disassembled. The main box requires another special tool to connect the wires to the terminal. Meanwhile, the wire sequence from the head does not match the wire sequence from the main box. There is a schematic in the manual so we figured it out but, it would be so much easier to have a dedicated connection. Upon powering up the unit, you are asked for a password. Unfortunately, no password is provided in the box or the manual. As it turns out, the system is supposed to be installed by a technician licensed by Furuno that would have the code. Luckily, Furuno agreed to help given that we are a recreational vessel. The unlock key sequence is: NAV/STATUS, DISP, BRILL, BRILL, BRILL. After unlocking the device, we followed the instructions to enter our radio information (the MMSI and Call Sign from our FCC license). We then entered basic information about our boat: name, length, beam, draft, and antenna location (relative to the boat). Finally, we entered our journey information to say that we are at anchor. We felt that this last bit of information was necessary since we are within a mile of the shipping lane and Fir's orientation is perpendicular to the lane. Upon powering up, the Furuno went through several sequences. After a few seconds, our GPS location stabilized and the system began populating a list of AIS contacts in the area. The initial list only displayed MMSI numbers. After a few minutes, list details were filled out with boat names etc. The system started generating alerts. And, when Joe went home at the end of the day he confirmed that Fir showed up on his Class B system which is several miles away. So, the simple system is working well. The next step will be to connect one of the COM ports of the main box to our NEMO using an NMEA0183 connection. This should allow us to display AIS target on our Coastal Explorer charts. Check back to see how this goes. July work on our Willard tender. Our tender will primarily be used to take soundings of the areas around Fir. Chart data is often years old and there are endless stories of boats that run aground when they relied on outdated information. With a draft of 11.5 feet and slow rate of turn, there are plenty of places where Fir will need to be careful. The right sonar system will keep the sounding data current on our electronic charts. This will allow us to use the tender to map anchorages before we commit to bringing Fir close to land.